Translation is stigmatized as a form of writing, discouraged by copyright law, deprecated by the academy, exploited by publishers and corporations, governments and religious organizations. 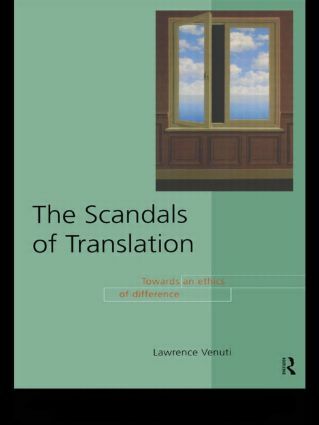 Lawrence Venuti exposes what he refers to as the 'scandals of translation' by looking at the relationship between translation and those bodies - corporations, governments, religious organizations, publishers - who need the work of the translator yet marginalize it when it threatens their cultural values. Venuti illustrates his arguments with a wealth of translations from The Bible, the works of Homer, Plato and Wittgenstein, Japanese and West African novels, advertisements and business journalism. Introduction 1. Heterogeneity 2. Authorship 3. Copyright 4. The Formation of Cultural Identites 5. The Pedagogy of Literature 6. Philosophy 7. The Bestseller 8. Globalization Bibliography. Index.